Park Locations allow a specific group of people to park a call in a private location that only specific individuals can pick up. To be able to do this, they must be added as authorized members of a specific Park Location Group in the AT&T Office@Hand online account. It allows Users to put a call on public call park and have a User pick up on another phone by dialing the park location. Follow the steps below to learn how to park a call and retrieve a parked call. 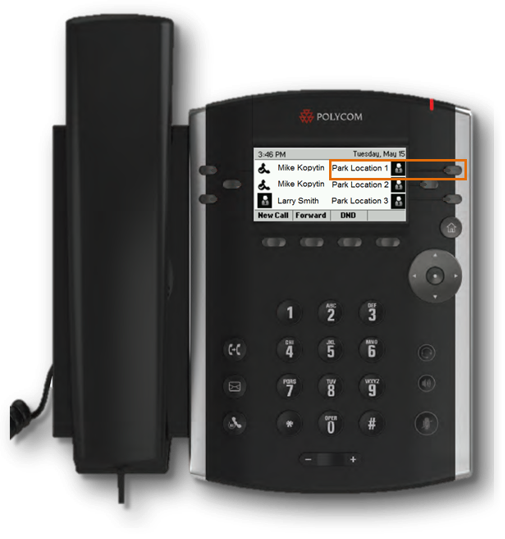 Upon picking up an incoming call, park the active call by pressing the soft key for the Park Location extension on your desk phone or Softphone. Note: From the example above, the extension will appear on the desk phone as Park Location 1. You can add a call to this Park Location when it is not in use. On an authorized phone, press the soft key to pick up the parked call on the Park Location 1 extension.